You’re busy, and maybe you have some extra hands helping you out. How do you record reimbursements in Wave if someone else makes a purchase for your business? Follow the process below and you’ll be tracking reimbursements in no time! When someone else makes a purchase for your business on your behalf, (i.e., using their personal funds, and not your business’s credit card or other accounts), your business has technically received a short-term loan from that person. This makes the money you owe them in reimbursement a liability. So how do you represent that? You want the accounting in Wave to match the reality of the situation, so you’ll need to create a liability account. The easiest way to do this and keep track of everything – considering you may need to reimburse more than one person over the course of your business’s life – is to create a short-term liability account under that person’s name. When you reimburse that person, you’ll create a journal entry showing the movement of funds from your bank account to the liability account, representing the reimbursement. Let’s take a look at an example. You need to reimburse Raj for some office supplies he picked up for you at Office Depot. You’ve never reimbursed him before, so you’ll need to create a liability account first. 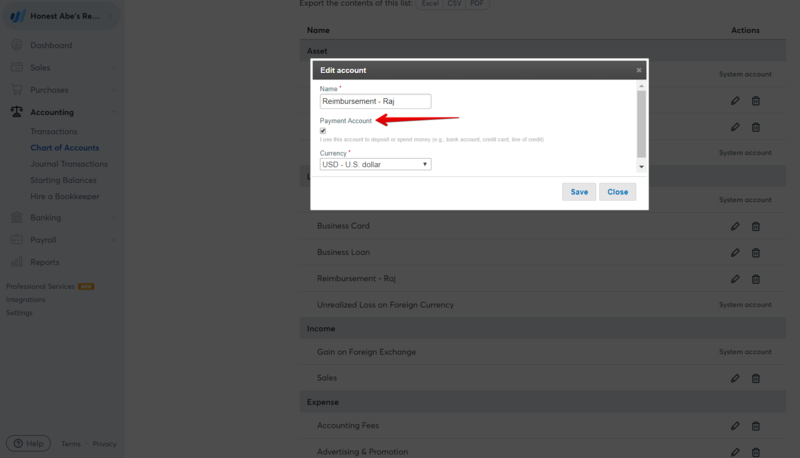 Go to Accounting > Chart of Accounts and click Add a New Account. Under the Liability/Credit Card tab, select Current Liability > Current Debt > Other Short-Term Debt, and name the account something that will help you identify it. In this case, let’s call it “Reimbursements - Raj.” Make sure you check the box below “Payment Account” so you can record outgoing expenses. 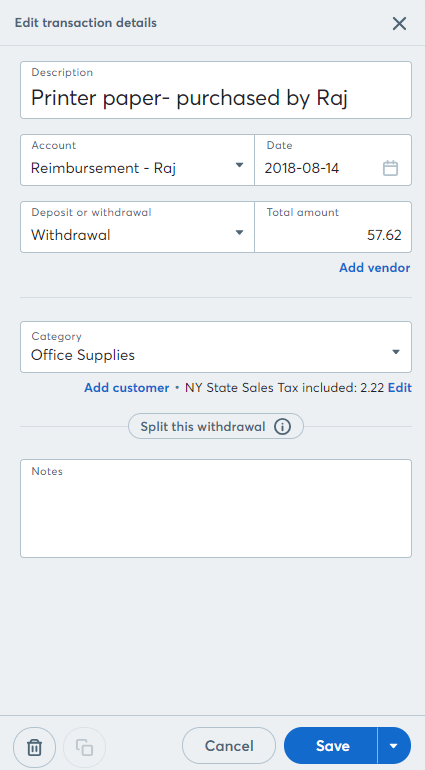 Before you reimburse Raj and enter that in Wave in Step 3, you can see the money you owe him (or anyone else you need to reimburse) by going to Reports > Balance Sheet and clicking on the account under Liabilities. Don’t forget to include any applicable sales tax! If sales tax was applied to the initial purchase and you want to record that in Wave, enter the grand total amount when you’re entering the initial transaction, and then select Show details and enter the applicable tax in the Taxes box. The tax amount will be calculated from the total – double check to make sure it matches the receipt. Now, when you’ve paid Raj what you owe him, you’ll want to create a journal entry showing the movement of funds from your bank account to the liability account, representing the reimbursement. Under Accounting > Journal Transactions click Add transactions. Enter a description line and select the reimbursement date. Credit your bank account the amount you repaid him, and debit the liability account the same amount. Click Save. If you’ve connected your bank account to Wave, when you see the expense transaction (the money you paid Raj) has been imported, you can just delete it. You’ve already accounted for the funds leaving your account using the steps above. You’re all set up! 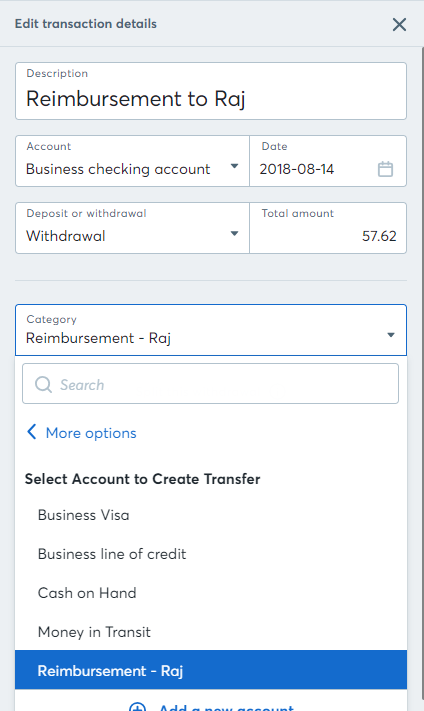 The next time you need to reimburse Raj, you can skip the first step of creating a short-term liability account, and just enter the transaction and the corresponding journal entry, using the same method. If you need to reimburse someone else, you’d follow the process from the beginning and create another liability account with their name before entering any transactions. So how do you represent that? You want the accounting in Wave to match the reality of the situation, so you’ll need to create a liability account. The easiest way to do this and keep track of everything – considering you may need to reimburse more than one person over the course of your business’s life – is to create a credit card account under that person’s name. When you reimburse that person, you’ll create a transfer from your bank account to that account, representing the reimbursement. Let’s take a look at an example! Why make the liability account a credit card? Remember that Raj buying something for your business is essentially him giving you a short term loan. Creating the “Reimbursements - Raj” account as a credit card ensures that the money you owe Raj is listed correctly as a current liability. Before you reimburse Raj and enter that in Wave in Step 3, you can see the money you owe him (or anyone else you need to reimburse) by going to Reports > Balance Sheet > Show Details. Don’t forget to break out any applicable sales tax! If sales tax was applied to the initial purchase and you want to record that in Wave, enter the grand total amount when you’re entering the initial transaction, and then select Include Sales Tax and select the relevant tax. The tax amount will be calculated from the total – double check to make sure it matches the receipt. Now, when you’ve paid Raj what you owe him, you’ll want to create a transfer from your bank account to the loan account representing the reimbursement. 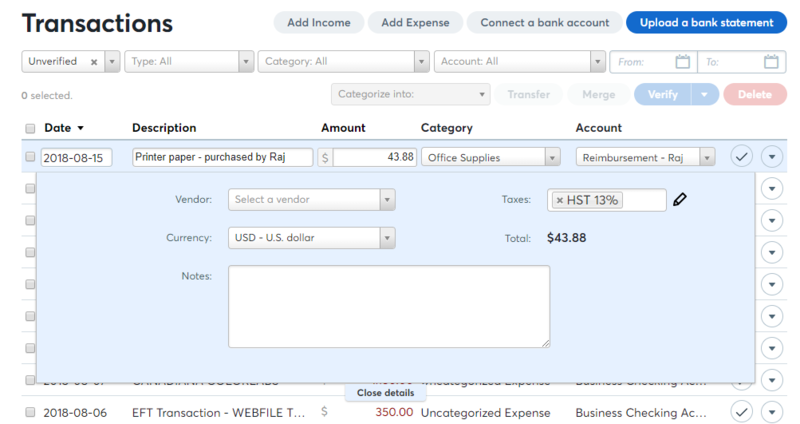 On the Transactions page, click Add Expense, and enter a description line. Select the reimbursement date and the total amount reimbursed. Under category, select Transfer to Bank, Credit Card, or Loan and select the “Reimbursements - Raj” account you created for this purpose. Click Save. Wave will automatically create a third transaction, showing the reimbursement (income) to the Reimbursement - Raj account. You’re all set up! The next time you need to reimburse Raj, you can skip the first step of creating a loan account, and just enter the transaction and the corresponding transfer, using the same method. If you need to reimburse someone else, you’d follow the process from the beginning and create another credit card account with their name before entering any transactions.